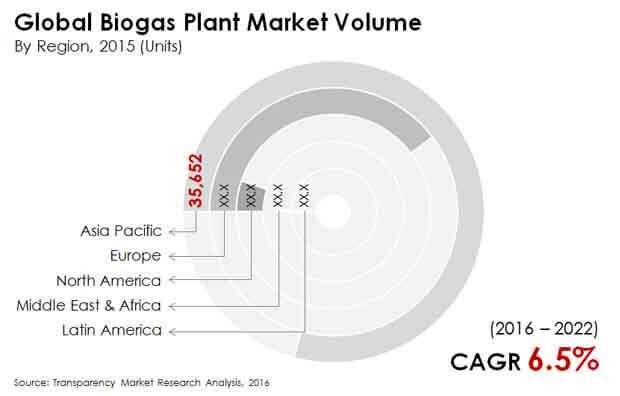 Asia Pacific led the global biogas plant market in terms of biogas plant volume generation as well as consumption in 2015. This region’s biogas market is projected to expand at a CAGR of 7.8% from 2016 to 2022. China, India, Japan, and Australia have so far been the leading nations in terms of generation of biogas in the Asia Pacific biogas plant market. Like the developed economies, the biogas plant market in APAC has also been led by agricultural waste and the F&B processing residue, and sewage sludge as core feedstock. The rate of investments are also rising greatly in this region for waste management processes. These factors, coupled with increasing pressure created by energy imports have compelled various APAC countries to focus on alternatives to fossil fuels, including ramping up the generation of biogas. The global biogas plant market report by Transparency Market Research provides in-depth analysis of the biogas plant market globally. The report segments the market on the basis of feedstock type and geography. The report analyzes the global biogas plant market in terms of biogas plant volume (Units) 2016–2022. For this research study, the base year is 2015, whereas the forecast is from 2016 to 2022. The report provides a comprehensive competitive landscape and features companies involved in entire supply chain of biogas plant including component providers, biogas plant manufacturers, suppliers, EPC players and others. This report includes the key dynamics affecting the biogas plant market globally. The analysis in the report provides detailed insights of the global biogas plant market. The drivers, opportunities, and restraints of the market were analyzed in detail and are illustrated in the report. The report also provides a detailed industry analysis of the global biogas plant with the help of the Porter’s Five Forces Analysis model.